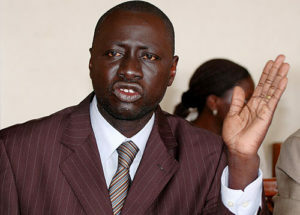 MP Reagan Okumu has threatened that northern Uganda will secede if he age limit bill is passed. File photo. KAMPALA–A fist fight has almost broke out in Parliament between FDC’s Reagan Okumu and NRM’s Musa Ecweru over the age limit debate. This followed a statement made by Okumu, reiterating Prof Ogenga Latigo’s message in which he hinted at secession in case the age limit bill made it through. “I want to associate myself with the Minority Report. You cannot amend the constitution before we have tested it. We cannot amend the constitution perennially in favour of one person,” he noted. “This debate may take any direction. But Uganda will either take Federal governance, or we secede. We have our voting patterns and we shall decide. I know you have the numbers,” he warned. However, when he took to the floor, the Minister of Disaster Preparedness Musa Ecweru hit at dismissing Okumu’s statements as mere threats. “The people of Amuria told me that even after the amendment is done with, we will still remain Ugandans. Nobody can come here and talk about secession. It’s only in the mind of the person who said it,” said Ecweru, prompting Okumu to shoot up though, he wasn’t allowed chance to make a rejoinder. Secession statements first came up on Monday when Prof Latigo was addressing the media at Parliament. Latigo told journalists that Members of Parliament from the North are particularly saddened that in the process of amending the constitution won’t benefit them in any way. “No body brought us to this country and so if anybody deludes him or herself that they own the country and all of us, then there is something coming,” he warned. Meanwhile, debating the Age Limit Bill Manjiya MP John Baptist Nambeshe said, “My people of Bududa have said no to the lifting of 102b. They also said no to the seven-year term”. MP Henry Maurice Kibalya was in agreement with him, saying the article sought to be amended can’t be discriminatory because even in his Christian faith, “God couldn’t have called only Jesus to be his son, yet we are all his sons”. “As the 10th parliament, we can succeed in amending Art 102 (b) but cannot succeed in amending the broken hearts of Ugandans out there,” MP Kibalya said. However, their colleague Mutonyi Masaaba disagreed with the two, supporting the amendment of the constitution. “My people told me to support the removal of 102 (b). When you have a wife who is cooking well, you don’t have to remove her from there,” she argued.